If there is such thing as a sweet tooth, I would like to suggest that there may also be such thing as a coffee tooth. 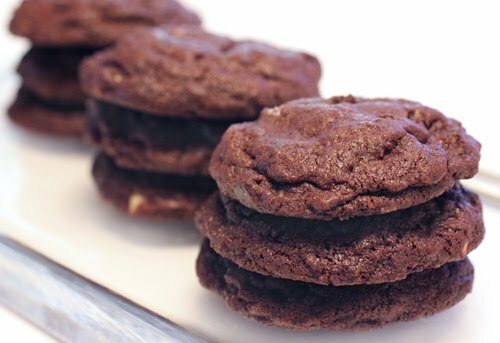 Going with that assumption, my coffee tooth has been acting up lately, and that led me to this recipe for double chocolate espresso cookies from Demolition Desserts . The cookie dough was made with cocoa powder and finely ground espresso, and dark chocolate and white chocolate chips were added. You might think a dark, chocolaty, coffee-flavored cookie like that would be slightly bitter, but this one wasn’t. I suspect it’s the brown sugar that smoothes out the flavors in the dough. The tender, almost-cakey texture is a nice surprise about them too. You can use any ratio you wish of white to dark chocolate chips, and I went with a whole cup of white to one-third cup of dark chocolate. In the recipe, the suggested method for preparing the dough is to stir it by hand with a large wooden spoon. I prefer the hands-free method of tossing everything into a mixer, so I went that route. The flour, cocoa powder, baking soda, baking powder, and ground espresso were sifted while the butter and dark brown and granulated sugars were mixed. One egg, vanilla, and salt were added to the butter before the flour mixture was mixed in just until combined. I folded in the white and dark chocolate chips, and then the dough was refrigerated for 30 minutes. Small, one-inch balls of dough were formed and baked for about ten minutes. These cookies are found at the beginning of the book with a few other versions of the chocolate chip variety like the chocolate chip cookies xs. This particular chocolate chip espresso cookie is also used in the chocolate chip mania dessert found on page 35 of the book. For that, the cookies are baked as minis and are stacked on top of a blondie with brown sugar-chocolate chunk ice cream and chipped cream with dark and white chocolate sauces. That sounds like a great way to satisfy a sweet tooth, a coffee tooth, and a chocolate tooth all at once, but for now, the cookies by themselves made me and my coffee tooth very happy. Those look pretty and delicious! I'd love some of these cookies with my cup of coffee right now. I am drinking coffee while reading this post. I am a coffee addict. "Coffee, you can sleep when you're dead!". I love espresso brownies and these cookies look like they would satisfy the "tooth!". 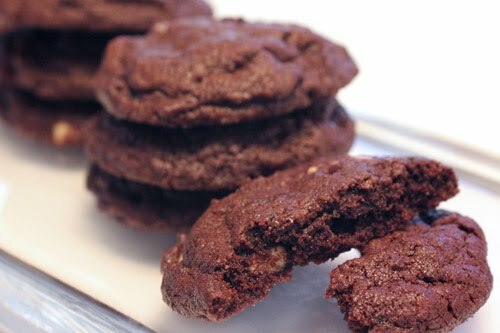 Espresso cookies with heavy chocolate touch...Lisa, you have put two magic ingredients in one cookie...just irresistible! hmm. perhaps one side of my mouth is filled with sweet teeth whilst the other consists of coffee teeth. i'm hopeless against these cookies. I'm not much of a coffee drinker these days, but I do like to go for an espresso cookie every now and then. Yum!! I've got the milk! Let the cookie party begins!! Any chocolate lover will clamor for one or ten of these. Coffee does a great job bringing out the flavor of chocolate. these sound great but no coffee for me after 11:00am or I WILL be up all night! I love pairing chocolate with coffee, these looks so good! Damn my husband and his coffee hatred! These look just perfect to me but if I make them I will have to eat them all. chocolate + espresso in one cookie, does it get any better? These sound delicious and not the thing for a gal with no self control in this area, wow! Love anything with espresso. With chocolate, that's a treat I would enjoy. I am wondering, though - how pronounced is the coffee taste? I mean, can you tell right away that there is coffee in the cookie? WOW that chocolate chip mania dessert sounds like it is NO JOKE! My mouth fell to the floor while I was reading that! Haha! These cookies look great and I'm dying to get that book because I love Elizabeth Faulkner! impressive site. every time i think i'm chocolated out, i realize NOT. espresso in a cookie....this is my kind of cookie! bewitchingkitchen: you can tell there is coffee in the cookie. it's definitely noticeable, but all the flavors are nicely balanced by the sweetness. I am sure my husband, the cofee-addict-extraordinaire will love them! I've got both teeth - coffee and chocolate. Actually enjoying a cup right now. I've got some valhrona and a special blend of espresso beans so I'm in luck. That's a super looking cookie! Nothing better than espresso and chocolate together- you can't beat it. I was at another blog looks at rich chocolate cake and now I have chocolate cookies.....great....I'm a choc-fanatic! I love the marriage of coffee and chocolate in desserts. It's how I flavor my favorite brownies, too. I so love the lovely combination of coffee with chocolate in sweet & savoury dishes!! Your cookies look to die for,.. The cookies sound wonderful with espresso! I am in definite need of a few of these today! I really like coffee and chocolate together. These are scrumptious with the two kinds of chips! 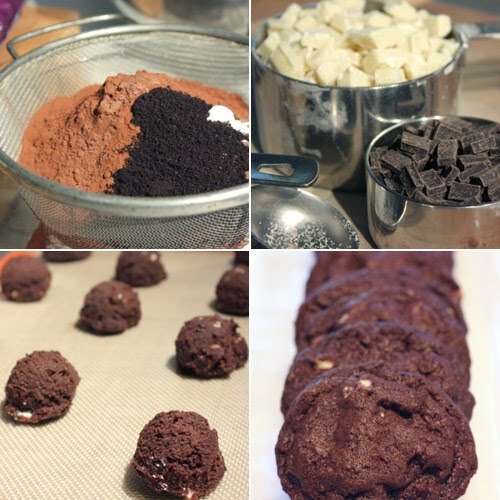 Hi Lisa, you have so many nice chocolate cookies in your blog!!!!!!!!! C'mas is coming, cookies time again! Your receipes look just great and really tasty. Thank you for this delicious time I spent through you blog.